Le Vide Greniers – empty attics. I know that a lot of people have heard about the Brocantes that can be visited all over France. For those who love old things, and you may have picked up that we do, they are a good place to visit to find vintage items; but….. having lived here I now find that they can, at times, be expensive, in comparison to what you can buy from the Vide Grenier. The Vide Grenier is basically like a car boot sale, only they tend to take place by village and it is simply all the old junk (or as I find treasures) from French people’s houses. The season starts in April and ends in October, and we love them. Since living here we have picked up some real treasures, but my real zest for old French items started when I found this old 1940’s metal desk in a vide grenier in Sarthe. The French people selling looked at me as if was ‘the mad English’ when I said that I wanted it; and I am currently sitting at the very desk writing this blog. 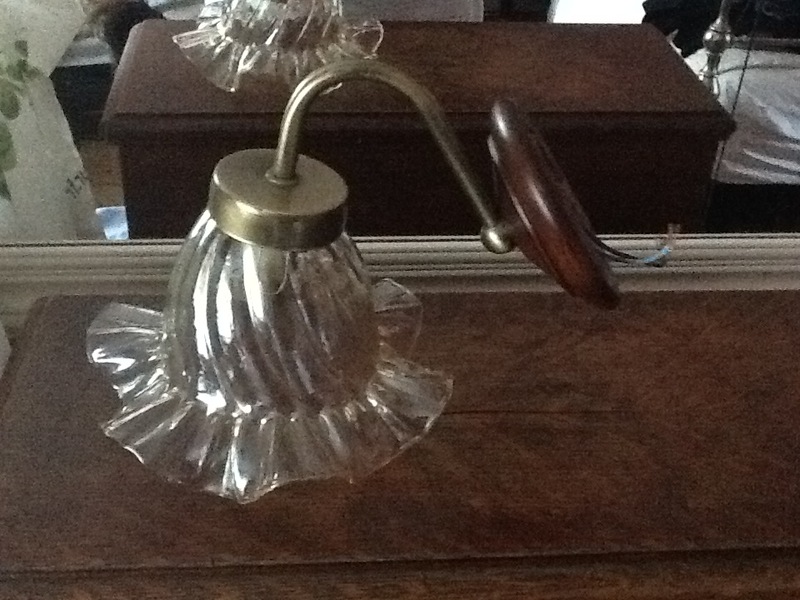 Then I found the beautiful lamp you can see in the photo another 1940’s item that is still working well. Sadly for those readers who also follow my Etsy shop these items will not be for sale. I love them waaaaaay too much!! Then there is the milk churn that is in my garden, for sale in so many vide grenier, the French just don’t seem to see their appeal; or the pretty painted milk jug that is evident in so many photos of my terrace purchased for three euro. I love a good milk churn me!! Let us not forget the cupboard that I bought this time last year from the Ambrieres vide grenier for twenty euro, that I chabby chic’ed up and it is now our log store. This year has been no exception. 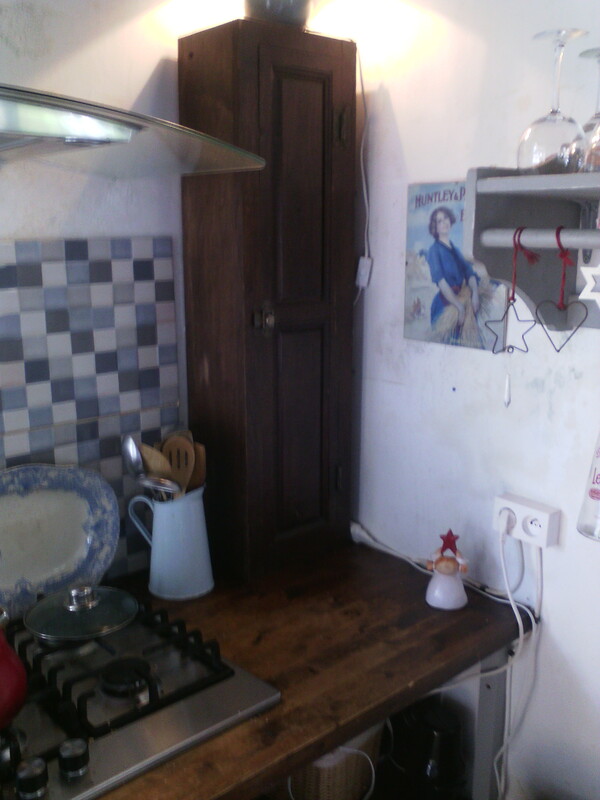 Recently we attended the Ambrieres Les Vallees vide grenier and found this old gun cupboard, which was perfect for the small corner of my kitchen by my hob. Whilst I love to chabby chic things up, I also love it when things have been naturally chabbied up by the life that they have had, and when they show it I, personally, feel it would be sacrilege to cover that up. So this will be staying the same, scratches, chips and all. 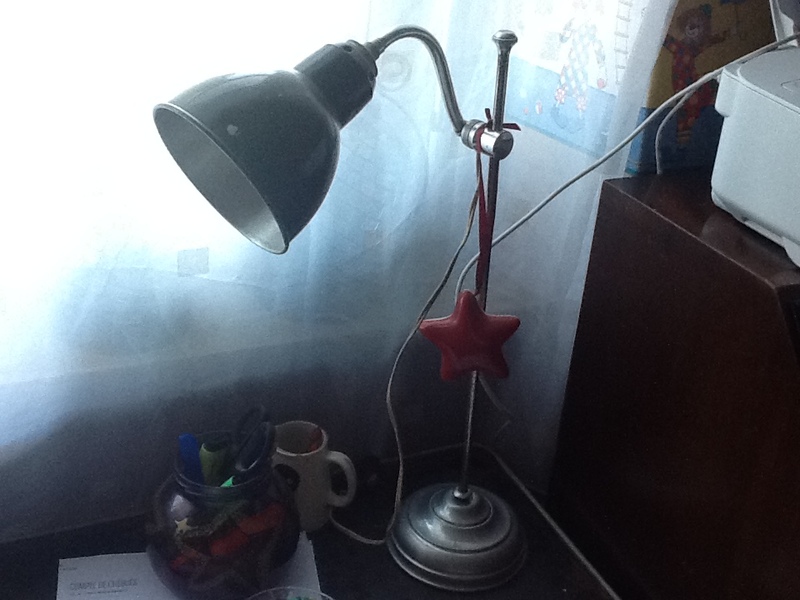 I love it, and all for only fifteen euro! Excuse the marks on the wall, it is still drying out from years of not being loved, and covered with non-breathable plastic paper, along with the vent being covered up. For a house with no foundations none of these methods of decorating are good. But our house is loved now and it is starting to show that it knows it! Off we then popped to another vide grenier ten minutes away and I found a wall light originally bought for the smallest room in the house, but it was too small to accommodate the light, so it is now for sale. And this pretty little pink stand , perfect for me as I am really in to grey and pink at the moment. Bless my husband good job he is in touch with his feminine side. I think the French think we’re mad. They love new things, but perhaps that is because they are surrounded by old things everywhere, whereas in England they are few and far between now. I could cry when I think of things that my mum and dad (God rest their souls) burnt when they first moved into their house. Over here the French don’t tend to throw anything away, everything has a value, or in some cases to them a stupid English person who will come along and buy it!! I love it!! I am in my element. So is Rich. But le pièce de résistance, which I have to confess was bought from a Brocante, is wash basin that we use to wash our hands in the loo. It is made from copper, comes from about the sixteenth or seventeenth century, is a large balloon container with a tap made out of pipe on it, with a small copper bowl that goes underneath. You simply fill the large balloon, that is on the wall, with water, et voila!! You can wash your hands opening the small tap to let the water out into the copper bowl below. It saved on plumbing and to be honest we didn’t want a small sink, we love it!!! So if you’re thinking of coming to France, between April and October, and you love a good boot sale, or finding old and beautiful things, I urge you to attend a vide grenier, especially in any medieval town, because the things you find there are amazing. As you can probably guess folks I am on a roll with my blogging now, I am on a roll with writing now as I have also started to write my book; so look out for more posts, they will be coming, and always please share and help me get my blog out there. Nice finds, and glad to hear you are working on a book. I’ll buy it! Thank you Ellen. Positive comments like that give me inspiration. There’s another post coming today.